Shape Without Form, Shade Without Color is a beautiful heartbreaking story. I was impressed by Sunny Moraine's skilled way with words. The story reads like poetry and I was blown away by their writing talent. 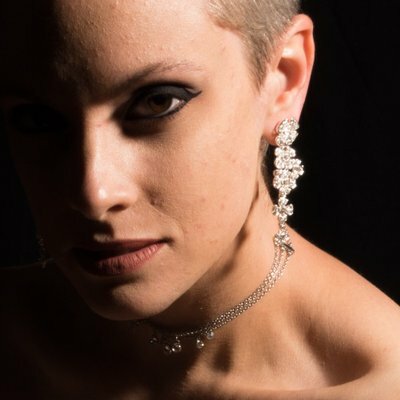 The woman in the story deals with creepy magical creatures and shadows that are watching her. She's in a spiral that can only go one way. Picturing what she's going through gave me a lump in my throat and I literally felt it in my stomach. Sunny Moraine knows how to make their readers feel, there's a certain inevitability to this story that moved me to tears. Their writing has a rawness and spine-chilling emotion that will stay with me for a very long time. Shape Without Form, Shade Without Color is a brilliant short story. It's thought-provoking, alarming, vivid and mysterious. I love that there's so much room for interpretation. The combination and overlap of fantasy and mental illness is tragic and profound. I admire authors who don't need many words to tell an intelligent multilayered story. I love how Shape Without Form, Shade Without Color keeps evolving in my mind. I've read it more than once and each time something new pops out and makes me ponder. This story is incredibly special and I will read it over and over again. 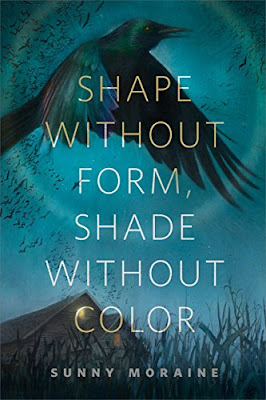 If you love stories where mental illness connects with magic you don't want to miss Shape Without Form, Shade Without Color. I’ve been professionally writing speculative fiction of various flavors for about a decade now, though I’ve always been a storyteller. My parents raised me on stories, reading to me, encouraging me to read, telling me their own stories (my father especially is a gifted improvisational storyteller) and encouraging me to tell my own to myself. Then I fell into writing fanfiction (which I still do very actively, and in fact I think some of my best work has turned out to be fanfic). So it was really almost inevitable that I would be doing this now. My parents are also both university professors, so the other inevitability is that I would become a part of academia myself. I never really questioned whether I would go to grad school; I just went, accompanied by my extremely patient then-fiancé/now-husband, who I met when I was still in high school. Over fifteen years later, here we are, chugging along pretty happily with two cats. I think we’ve done all right. 2) Shape Without Form, Shade Without Color is a combination of mental illness and magic, why have you chosen this combination of subjects? This story is actually not the first time I’ve combined those two things. “Singing With All My Skin and Bone” (originally published in Nightmare Magazine and now the title piece in my debut fiction collection, available wherever fine creepy books are sold) is one that uses compulsive self harm to tell a story about blood magic. My most recent story, “Your Slaughterhouse, Your Killing Floor” in Uncanny Magazine, is a kind of superhero narrative featuring two women who can use their own physical pain as weapons of destruction. I think I keep coming back to this because I’m fascinated by the deeper meaning of pain and suffering, and how we make sense of what seems so senseless at times. Pain itself has an immensity that’s difficult to put into words; the writer Elaine Scarry has said some wonderful stuff about how pain is intrinsically language-destroying, and can be ultimately conveyed only through wordless groans and cries. So I’m interested in pain as something that extends beyond us and our minds and bodies, that can alter and manipulate not only our interior worlds but our exterior ones as well. I’m also fascinated by the idea of pain turned around and used as power rather than weakness, even power of a very terrible kind. That’s obviously coming from a very personal place; I’m not shy about admitting that I’m working out many of my own issues there. 3) Your story is raw, beautiful and sometimes incredibly scary, was it difficult to write this emotional roller coaster? I actually wrote this story during a time when it was very difficult to write at all, or at least to write anything I could submit for publication. It was a bad year for me, and I decided that since I couldn’t run away from that badness, I should just try to pour it all into a story. I think the only way I was able to make that happen was by rejected a traditional story structure, though; when you’re dealing with really difficult mental illness, you often don’t experience the world in an orderly way, and that meant eschewing an orderly writing process. If I had tried to impose a structure on it, I don’t think it would have happened. But once I took my hands off the wheel and simply let it come, no, I don’t think it was actually that difficult. Writing it certainly wasn’t any more painful than living it at the time was. 4) You’re a PhD candidate in sociology, do your studies inspire your stories and how do you combine being a scholar with writing fiction? There’s a lot of movement in both directions; I usually find myself doing sociology with a heavy narrative bent more than a traditionally “scientific” one, and thinking about people and social forces in one field is naturally going to affect how I think about them in another. Direct subject matter inspiration is a bit rarer, but it has happened, especially recently; my dissertation deals with extermination camps, and a novella I just completed is heavily focused on historical atrocity in general with several scenes set in one of the Nazi camps (Bełźec). So it and the dissertation can almost be read side by side in some respects. It doesn’t surprise me that that happened; I think one tends to write what’s in one’s head, and my head has been full of extermination camps for about a year now. It’s shown up in my teaching, too. When I teach sociology, especially introductory courses, I often incorporate short SFF fiction to illustrate concepts. Some students respond really well to that and some seem puzzled and even frustrated by it, but it’s always interesting. 5) Where does your choice of thought-provoking themes to write about come from? I frankly don’t know. I write whatever comes to me, whatever happens to be running through my head and tugging at me as it goes by. I write about the stuff that makes me think, and if other people are captured by it as well, that’s my good fortune. 6) Can you give our readers some information about Gone? It’s a serial horror audio drama about a woman who wakes up one morning to discover that her wife and everyone else in her immediate vicinity - and in fact seemingly everyone in the world - has vanished. From there she has to figure out how to cope with her situation, both in the short and long term, while struggling to make sense of what’s happened and in the end to maintain her own crumbling sanity. At the core of it is actually a romance gone wrong, a story about relationships and what happens when they turn poisonous because of half-truths, lies, and repressed anger and resentment. It just wrapped up its first season, but I do have a second one in the preliminary planning stages, and I’m hoping to launch it early this summer. 7) You have an editing service and have seen a lot of manuscripts, what’s the most common mistake made by beginning writers? There are a lot of smaller common mistakes, but what’s at the core of many of them, I find, is a kind of timidness where the reader is concerned, a fear that you won’t get your ideas across to them without a lot of explaining. That often leads to overwriting and overdescription, which contributes to larger pacing issues. While obviously beginning writers also sometimes struggle with a lack of clarity, it’s really important to trust a reader, to give them enough credit to take them along on your journey without constantly stopping to point out every item of interest. An even bigger guiding point, in my opinion, is simply that one should get rid of anything that doesn’t serve the story. Scenes, characters, even your own process - if it’s not doing some kind of job within the story itself that contributes to moving everything forward, it probably shouldn’t be there. What “moving everything forward” means is going to vary from story to story and writer to writer, but as a general principle I think it’s a useful one. 8) You write speculative fiction, what fascinates you the most about the genre? Honestly, what fascinates me most is the same thing that draws me to sociology: it allows you to examine worlds and human beings (and non-human beings) in ways and from angles that other genres don’t. One can perform all kinds of thought experiments that can’t be done in any other imaginative space. To me it feels like there’s such a tremendous degree of freedom, so much more room to maneuver and so many more tools in the toolbox. When I think about writing something without a speculative component, I start to feel a bit cramped, as if the room I’m in has gotten smaller. Aside from season 2 of Gone, I’m hoping to wrap up my doctoral dissertation in the next couple of months, defend, and finally graduate. That’s probably the biggest and most pressing thing in front of me at the moment - I’m going into my ninth year of grad school and I so desperately need to be finished - but in addition to that, I’m about a third of the way through what I hope will be my next novel. I’m also poking at some ideas for interactive fiction, which I’ve never tried to write before and which scares me very much but which I would love to be able to do. And of course I’m always poking at short stories. One thing I’m never short of - for better or worse - is stuff to do. One very lucky reader of With Love for Books will receive a signed paperback copy of Singing With All My Skin and Bone by Sunny Moraine. 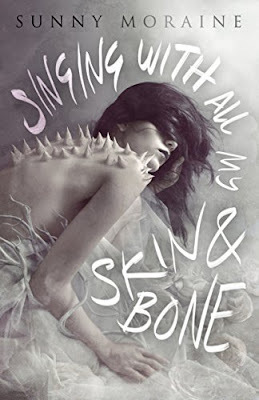 I've just read some of the reviews for Singing With All My Skin and Bone on Goodreads and if the real thing is even half as good as they all say then one lucky winner is in for a real treat! Both of these books sound so interesting and dark!! Shape Without Form, Shade Without Color sounds like a thought-provoking and mysterious short story. These books sound fantastic and really interesting, can't wait to read them. They sound intriguing! I can't wait to read them. sounds wonderful! the cover makes me ponder too. In reading the interview I realized that not only in writing but in real life I do the exact same thing, overexplain something and don't give people credit for knowing what I'm talking about, I point out the obvious and instead need to keep the conversations moving forward! :) Good luck with your doctoral dissertation! You are a new to me author but your book does sound intriguing. As Lewis Carroll said, we all believe our dreams are real while we're having them; people we say have a mental illness may have simply forgotten they're awake. The title is awesome! Makes you wanna dig in and see what the inspiration for it is!! Just the title makes me want to read this book! The book sounds great and I'm intrigued by Gone. i would love to read this book , love a good book ! "Shape Without Form, Shade Without Color" is one that I might just Need To Read. ...Briefly: I wandered off into a doctorate in Clinical Psychology, despite always knowing that I was a writer. This short story looks just beautifully... reminiscent, of something or other. It looks like there might be some magical realism? The story looks so intriguing, and I'd love to read some of Ms. Moraine's work. This book sounds fantastic! I would love to read so will be adding to my Good Reads list.